The mastfoot of my first Minisail gave way this afternoon. 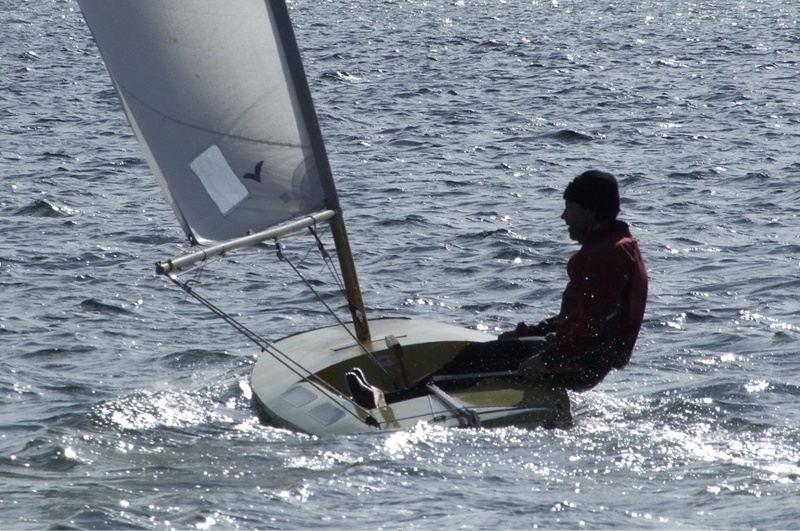 3 to 4 Bft wind, the boat went really well and I was enjoying the comfort of a footwell for a change. Practising Monaco sailing to be ready for the Nationals next weekend I was hard on the old boat hiking out like a ninja to keep the boat level upwind, including doing some fast gibe manoeuvres. In the middle of the pond planing during a fun reach the mast went to leeward with a cracking sound but the hull kept level: Mastfoot gone. The mast held on to a 35 angle to the hull and I was able to continue on a broad reach making berth without any help. It was a weird 5 or 10 minutes sailing with no sail control at all (boom and rear of sail dragging through the water, the mast swinging slightly back to forth) the only thing I could do was steer and keep fingers crossed. Actually the last minutes were quite fun coming in cheered on by the audience from our club’s terrace. I took the yellow Monaco out this afternoon because I suspected it might well be the last time before for a long while to sail her. Shortly Minisail 2848 -another Monaco- will arrive and replace it. Must be a coincidence it collapsed on it’s last sail. The old Yellow Monaco will now be transformed into sort of a “Meson”; A GRP hull with a wooden deck. Could be a while before it hits the water once more though.